Feige Filling Technology Asia Pacific Pte. Ltd | Bag filling Systems in Singapore :: Feige Filling Technology Asia Pacific Pte. Ltd. The "Liquidus" made by Feige sets the benchmark in automatic filling of liquid and pasty products in plastic bags. Feige Filling, the leading manufacturer of filling machines for liquid and pasty products, has succeeded in developing a fully automatic machine for the filling of pasty products in plastic bags. Already last year, the semi automatic "BagFiller" has been launched in market. The positive experiences which have been made with this type of filler have lead to the development of the "Liquidus", in co-operation with the parent company Haver & Boecker. The "Liquidus" is an automatic filling machine which enables the filling via filling valve of up to 640 plastic bags/h (25 kg each) with pasty products. This enormous output is feasible thanks to the well proven Feige product control providing high speed and clean filling appropriate for verification. The scale software controls the product flow and thus the degree of opening of the filling valve. The instantaneous weight is continuously measured during filling and subtracted from the target weight (product flow). A control algorithm uses these values to achieve the exact fill weight. When filling is completed, the remaining air in the bag is extracted to prevent the product from getting into contact with the surrounding air before the bag is closed. 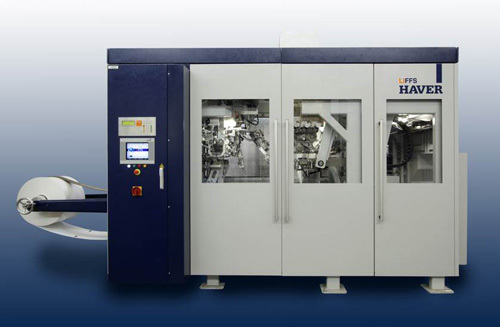 The proven Haver & Boecker FFS machine is the component which produces and handles the bags. Through the co-operation with the parent company the filling process has been harmonised. Due to the integrated design, comprising all components from bag production to bag out-feed in one equipment, the "Liquidus" can be set into operation with least installation work. Once the product line for supply and return and compressed air is connected and power supply is put on, the new bag filler can straight be used. This filler reveals remarkably new possibilities for the filling technology as filling in plastic bags is an attractive alternative for the user referring to economic and environmental aspects. Up to now the building industry has used pails to bring their products (ready-mixed plaster, paints, adhesives, etc.) to the customer on site. Bags, however, are much smaller when the product is used up and can easier be disposed of. Thus, the waste material is clearly less. Compared to an empty pail, another environmental benefit is the easier transport of the empty bag roll from the packaging material manufacturer to the building material manufacturer. And the roll of empty bags requires much less shipping volume. Furthermore, the production of a bag needs less raw material. This is an aspect both the filling company and the consumer will benefit from as the prices go down. This new way of packaging is certainly a milestone in environment protection, leading at the same time to reduced costs. In short, the "Liquidus" made by Feige Filling revolutionises the fully automatic filling of liquid and pasty products.